Do y’all need a dinner for two recipe to go with all those desserts for two recipes? I thought you might. I whipped up one of my favorite dinners: risotto. But, I scaled it down to serve two, and fancied it up with some lemon zest and spicy grilled shrimp. You’re going to love it. 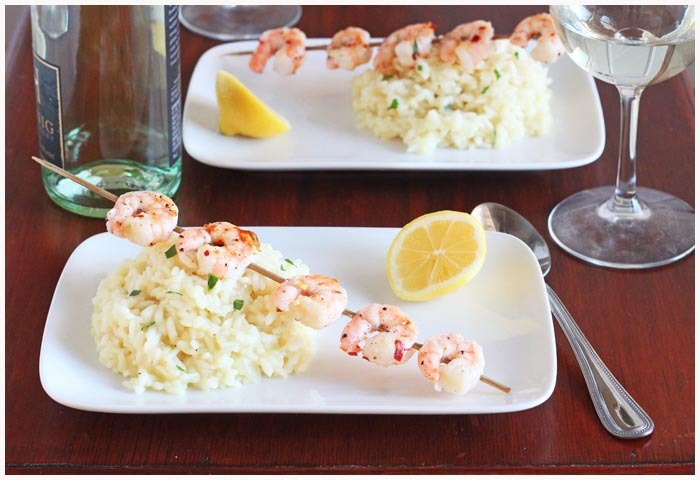 I’m sharing the recipe for my Lemon Risotto with Grilled Shrimp over on Food Fanatic today. LOVE shrimp Christina. Great choice. This looks like a special, yet approachable meal! Risotto is my favorite. I love htis! That risotto looks so creamy and delicious! Wahoooo I love risotto and shrimp! This meal with your champagne sundaes for dessert afterwards sounds like an excellent Valentine’s Day to me! Love this light and easy recipe, Christina! 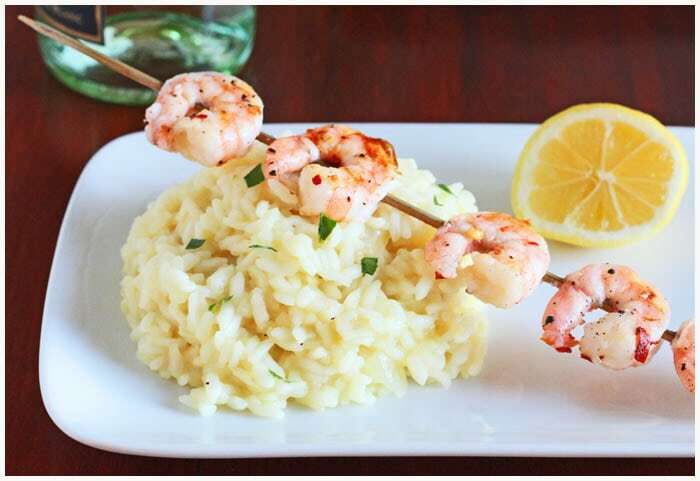 Grilled shrimp and risotto are favorites in this house, so this is a must-try combo! This is my kind of romantic meal! yum. I think this risotto and your champagne sundaes for dessert will make the perfect Valentines evening! Normally, I do eat dessert first but with this risotta I would gladly skip that unhealthy habit. I guess we should probably eat dinner before all those great desserts! Love both shrimp and risotto – what a comforting, lovely dinner idea! Yum! I love your dinner for 2 posts! They rock! The lemon adds a totally new dimension! Risotto is always a hit. The only downside, there are never enough leftovers to make my Gramma’s famous rice balls. What a perfect Valentine’s Day dinner! Oh, can’t wait to give this a try! How delicious! oo and that Risotto oooo I’m in love! I made this for our Valentine’s Day dinner — it was delicious!! I would not have considered adding lemon zest to the risotto, but it was perfect!